If you have not visited Denmark before and you are wondering what are the reasons why everybody who has been in Denmark is so thrilled about this country and its notable distinctions in the implementation of eco-friendly policies, you need to know that by the end of this article you will definitely start looking for tickets to plan your next trip there. From dynamic cities, to beautiful beaches, stunning landscapes, and amazing history, despite its modest size, Denmark is an amazing country which has numerous things to impress its visitors and make them have an amazing time during their trip there and wish to never go back home once they get in contact with the environmental-friendly experience which they can have there. Read below the collection of best reasons why you should definitely visit Denmark at least once and learn the best practices which are extremely successful there in order to join the cause of protecting our planet for a better future for ourselves and the future generations. One of the most famous aspects known about Denmark is the fact that it is the most climate-friendly country in the world. Denmark has numerous eco-friendly policies to protect the environment by reducing pollution and the waste of natural resources. Urban development policies are a great success in Denmark when it comes to the protection of the environment and this is also one of the reasons why the Danes are known to be the happiest nation of the world. Living in a healthy environment definitely has a great positive impact on your health and general wellbeing. Considering housing, transportation, sustainability, and eco-friendly culture, Denmark is the most livable country in the world. One of the most powerful solutions which Denmark found for combating pollution and the waste of natural resources was to reduce corporate pollution. We all know that large companies are extremely negligent about the way their business affects the environment. Companies located in Denmark use balers and bale presses for compacting and recycling the waste which they produce which has substantially reduced the damage which is brought to the environment. Also, another notable eco-friendly policy which Denmark has implemented and had a great influence in the development of an environmental-friendly culture across the whole country is the fact that it has reduced the greenhouse gas emission and have invested immensely in developing and improving the use of renewable energy with the help of solar or wind energy. Another great urban planning policy which has made Denmark be the most climate-friendly country in the world is the strong cycling culture which can be found in every corner of the country. We all know that large cities are dealing with the tragic problem of heavy air pollution due to the heavy traffic and traffic jams which happen on a daily basis especially during the rush-hours when citizens are commuting from their homes to their jobs and back. Seems like Denmark has understood how damaging this situation on a daily basis is to the quality of the air which they breathe and the environment and have decided to make a collective change. Citizens around Denmark, not only that they respect and encourage the cycling culture in order to be part of the cause of protecting the planet that we live in, but they are also extremely aware of the health benefits which they get from cycling instead of using their personal cars to get to their jobs or back home. 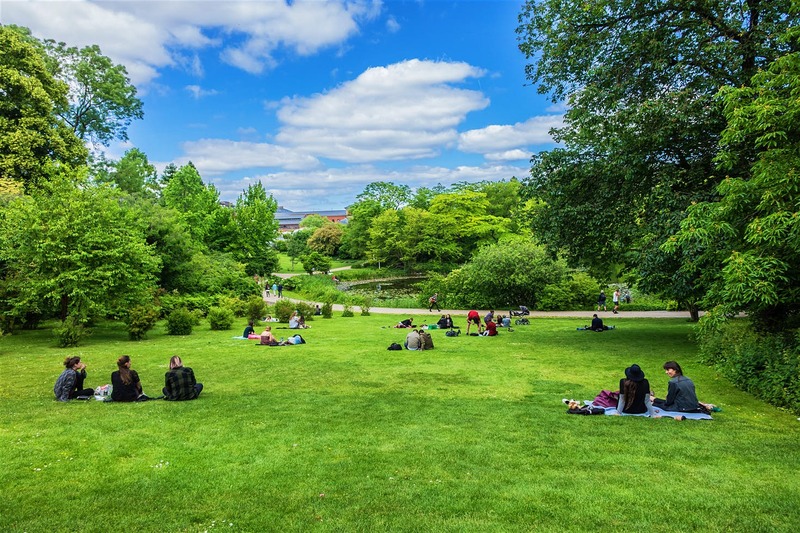 Apart from stopping or reducing the things which lead to heavy pollution and the damage of the environment, one of the most powerful urban development policies which Denmark has implemented in order to combat these problems is building several green spaces. Due to the wish of protecting Mother Nature and helping the world deal with the problem of the substantial loss of biodiversity, Denmark has been focusing on building numerous parks and green spaces which can reduce pollution and improve the air-quality which the citizens are breathing. There are numerous Danish policies which aim to protect nature, species, and habitats. Also, the Danish acts which imply the climate-friendly policies aim the protection and conservation of forests and to contribute to increasing forest and green areas in Denmark. Another important aspect why you should consider visiting Denmark to learn from it is the fact that the Danes are known as very relaxed and talkative individuals. Probably the Danes have discovered one of the most important secrets of improving their tourism which is being nice with the visitors. Unlike the citizens of other countries which seem to be disturbed by the large number of tourists which come to visit their most amazing touristic attractions, the Danes have realized the importance of embracing the large number of tourists and make them feel great when they are visiting their lands and trying to teach them the most important lessons of what has made their country so developed. The Danes are known to be extremely nice and helpful to each other, as well as with foreigners. They have a strong culture of positivism and enjoying the little things in their lives such as spending time with their loved ones or small guilty pleasures such as delicious foods, hot chocolate, or days spent on the beach or green areas. Visiting Denmark and being around the locals will definitely boost your positivism and make you become more grateful for the small but beautiful things from your life. We should all take the example of Denmark when it comes to implementing eco-friendly policies for the protection of our Mother Nature. Renewable energy, smart city solutions, recycling, as well as happiness and health are definitely great lessons to learn from a different culture than yours and take back home to make a change for the better in the place where you live in as well to join the cause of protecting the planet that we all live in and its generous resources.